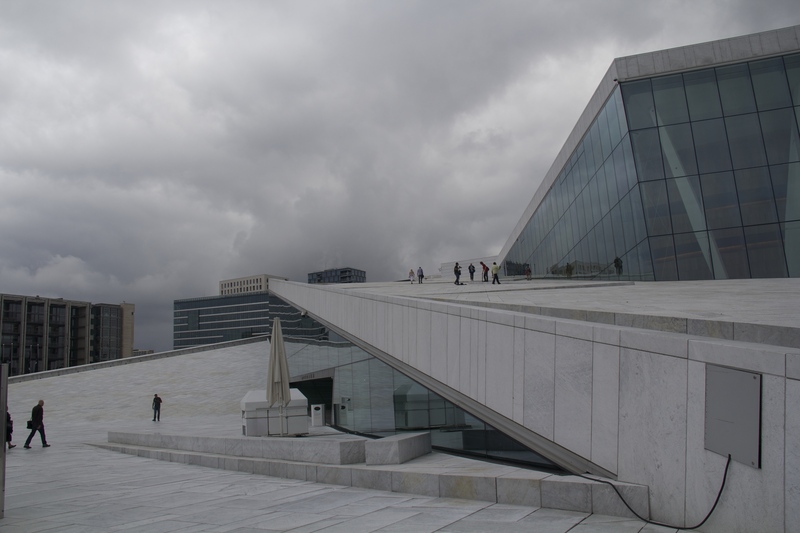 One of the things that I really wanted to see in Oslo was their famed Opera House. I must admit that I’m not the biggest fan of opera. Don’t get me wrong, I have tried opera several times but unfortunately each time I just get frustrated with the fact that I can’t understand what people are singing, even when they are singing in English. So why did I want to visit the Opera House? I wanted to see it because it’s beautiful. The Opera House was opened to the public in 2008 and its architects intended for it to look like a glacier floating on water. I decided early on that I wanted to take a tour of the building and overall it was fascinating to walk through all of the elements of the Opera house and learn more about what goes on inside. The Opera House has 5 different stages which it can use, and it can even conduct outdoor concerts (you can climb up and down the roof so for an outdoor concert they simply line the roof with chairs). The Opera House is the home to both the Norwegian National Opera and Ballet, and on average if you include all of the work that goes into making the costumes, props, as well as rehearsals for the dancers and singers, a production takes two years to complete. Unfortunately there weren’t any shows on at the Opera House when we visited, but we still got to sit in the main concert hall. 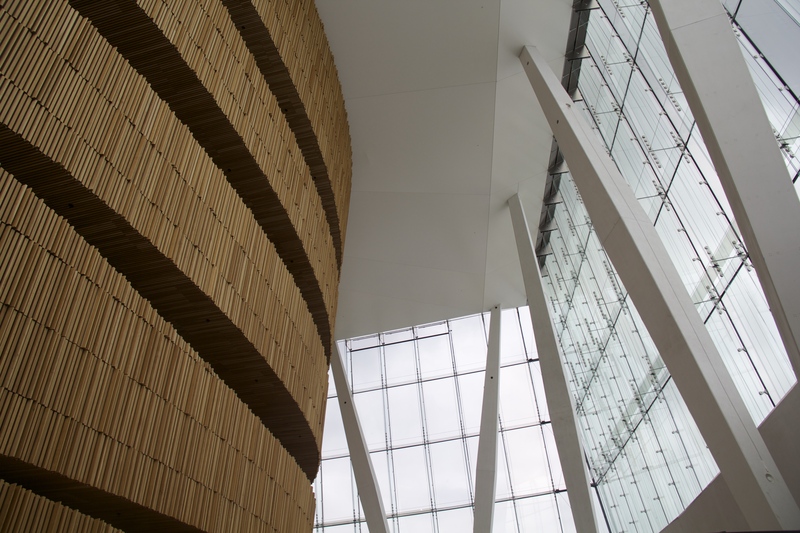 One thing that Norwegians are particularly well known for is their commitment to equality, and this really manifests itself in the design of the concert hall. We were told that no matter where you sit in the concert hall the sound should be exactly the same. 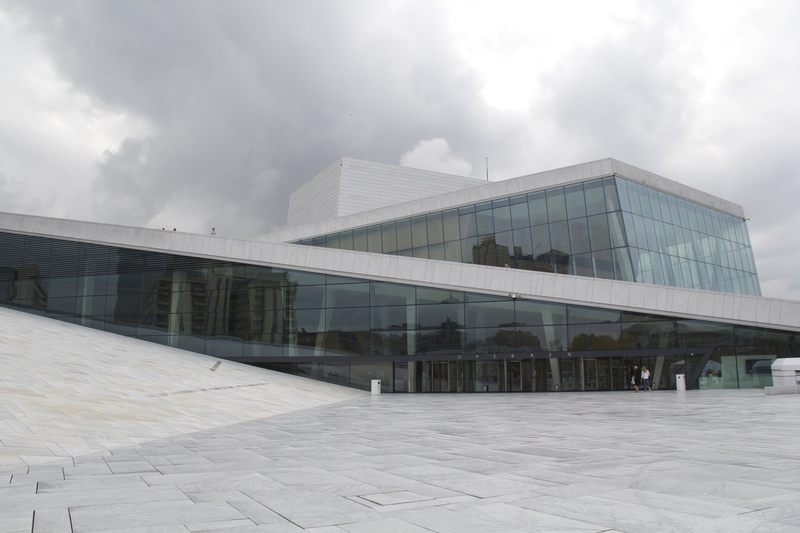 In addition, the Opera House is intended to be accessible for all people (which makes sense considering the number of tax dollars that went into building it) thus it’s a requirement that for every show there must be 100 tickets available priced at 100 kroner (~16 USD). After our tour of the opera we went to the Nobel Peace Center. 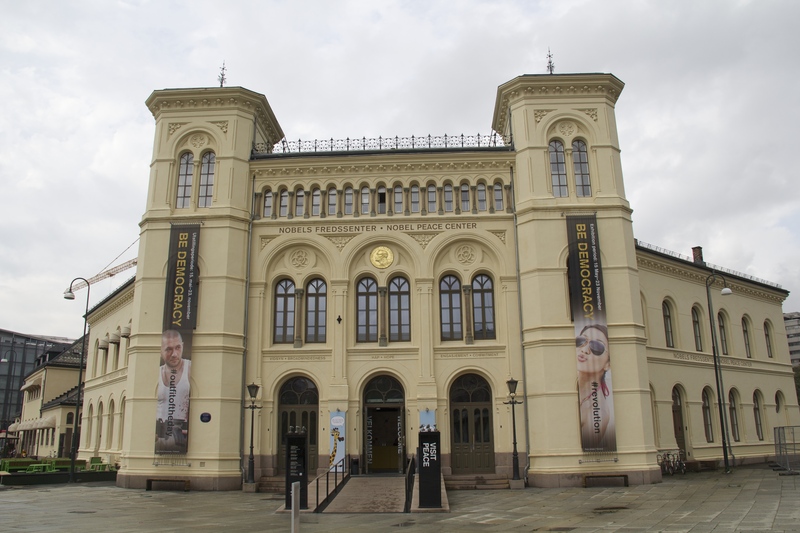 The Nobel Peace Center is not where the actual peace prize is awarded, but is a museum about the Nobel Peace Prize and its winners. When we went the first floor was dedicated to social media and it’s impact on democracy. The main focus was on whether social media encourages productive debates through freedom of speech or whether it hinders debate because there are simply too many voices involved. Some fun facts that I got out of the exhibit are that 41% of the world’s population has access to internet but a staggering 1 in 5 people has a social media account. There was also a section on surveillance and whether or not it is a threat to democracy. Yes, there was even a piece on the NSA and Edward Snowden. While the first floor was fun, I think that by far the most impactful part of the Nobel Peace Center was its segment on the 2013 Nobel Peace Prize winner, the Organisation for the Prohibition of Chemical Weapons (OPCW). The OPCW has helped destroy 80 percent of the world’s chemical weapons and has recently come into the spotlight for the work it is doing to destroy Syria’s stockpile of chemical weapons. One really happy fact from this exhibit is that when organizations such at the OPCW go to destroy a country’s supply of chemical weapons the host country usually turns over all of their chemical weapons. If chemical weapons are missed it is often because a a small reserve has been forgotten, not because the country was being deliberately negligent. While it’s very easy to associate chemical weapons with Syria, the OPCW works in many countries and still has a lot of work to do even in Europe. World War I has left its mark on Europe in many ways, one of which is the ‘iron harvest’ or undetonated mines and shells in Flanders. Belgium unearths as much as 100 tons of munitions a year, which is a fact that I personally find both incredible and frightening. Overall I left the exhibit with a very healthy respect for the work that the OPCW does around the world.